We speak to retailers about training regularly; what makes good training and not-so-good training. Ultimately, training involves important teaching elements — ensuring that trainees retain knowledge but also “learn by doing.” Some folks subscribe to the idea that learning by doing is best. Every register needs a We Card calendar! Not only does the calendar assist frontline employees in calculating the correct age for a legal tobacco or vaping product sale, it also serves as a daily reminder to employees that they need to ask for and check IDs for customers who are Under 27. It serves as a reminder not just visually but by the daily act of removing the page as the days turn. In the last 12 months, FDA, which has oversight over tobacco and vapor products, has issued three new guidance statements and conducted more than 100,000 compliance checks. Do You Sell Cigars Individually Without Packaging? If you sell cigars – such as premium cigars – that have no packaging and are sold individually, the FDA requires a specific sign at every point-of-sale. Introducing the Free Age Checker App - Download it today! Hold, Sweep, Flip, SCAN. Simple, fast, and a critical step. Calculating a customer’s age is one of the most important steps in “carding” under 27 year old customers of age-restricted products. FDA Cracks Down on Selling e-Cigarettes to Minors! FDA Commissioner Scott Gottlieb, M.D., issued a statement today, April 24, 2018, indicating, “FDA has been conducting a large-scale, undercover nationwide blitz to crack down” on the illegal sale of e-cigarettes to minors. The FDA Regulations say the minimum-age to sell tobacco and vaping products is 18, but it may be different for your store. Back in November, The We Card Program started getting some inquiries from retailers about federal, state and local legal ages to sell tobacco and vaping products. We thought it would be a good time to reinforce this knowledge. Your state or local laws regarding the minimum-age to sell tobacco and vaping products supersede the Federal regulation’s (see page 13) minimum-age of 18 years old. 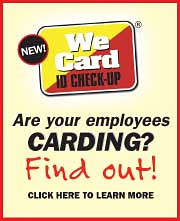 Are Your Employees Carding Enough? You’ve trained your employees. Equipped them with signage and age calculation tools. But now, how can you be sure they’re “carding” under 27 year old customers? “We Card focuses on training and education. It’s terrific to see 38 Governors show support for We Card Awareness Month. It highlights retailers’ desire to do the right thing to prevent age-restricted products to minors,” said Lyle Beckwith, Senior Vice President, Government Relations for the National Association of Convenience Stores.